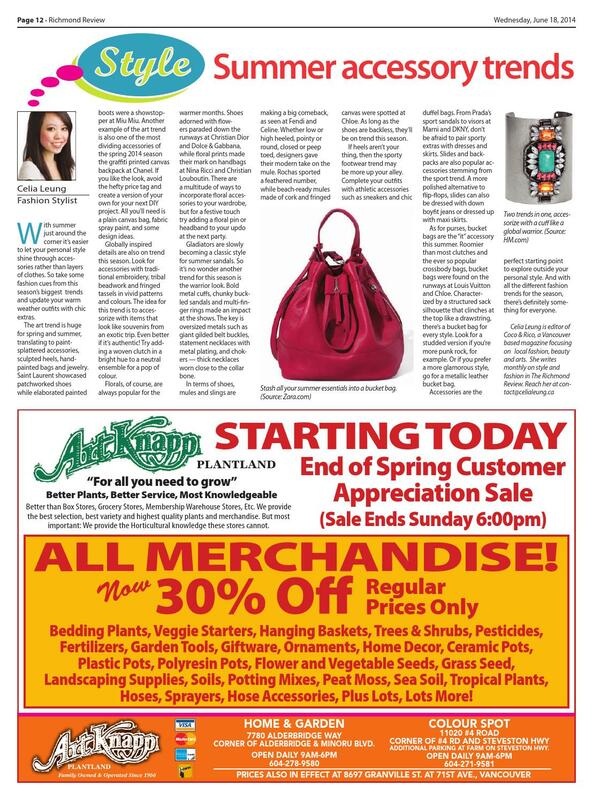 Spring and summer fashions focused on athletic styles, crop tops and artsy prints. And while we do see some overlap in the trends transitioning into fall, this season is all about the mod vibe, cozy textures, bold graphic prints and colour combinations. With trends ranging from low-key, casual knits to dramatic patterned dresses, the fall and winter season has something to suit every style. One of the biggest trends to hit fall collections is the 60s look. Gucci channelled the swinging 60s vibe with structured, collarless pea coats. Over at Dsquared, 60s glamour and shorter hemlines owned the runway as the designers displayed fur trimmed shift minidresses and blue python microminis. Youthful shift dresses at Saint Laurent paid homage to London’s 1960s mod and music scene. Characterized by A-line coats and short hemlines, complete the retro 60s silhouette with mock turtlenecks and knee-high boots. Sixties mod revived at Dsquared. In terms of fabrics for this season, the cozier the better. Befitting the colder weather, knitwear is a huge trend for fall and winter this year. And the main idea is to go big or go home. Overexaggerated sweaters and head-to-toe knit ensembles were spotted at Celine and Marc Jacobs. Michael Kors, meanwhile, paired their luxuriously long cardigans with chunky knit scarves. And the normally glamorous Lanvin added some casual elegance to his collection with ruffled-hem sweater dresses. Mary-Kate and Ashley Olsen’s fashion line The Row, in particular, took knitwear to another level with a look consisting of an extremely oversized cowl-neck cashmere sweater and matching knit skirt. For the fashion forward, rock the sweater trend with knit pants this season. Cozy up with knit on knit fashions as seen at Celine. Shearling is another huge texture trend for this season. The plush fur, faux or real, can add a sophisticated touch to any outfit. The easiest way to incorporate shearling is through a coat or vest like at Isabel Marant. Whether lined with the fur or just small trim details like at Oscar de la Renta, the textile creates a luxe Aspen vibe. Prada and 3.1 Phillip Lim both showcased colour-blocked, patchwork shearling coats, Marni mixed the fur with metallic. Perhaps it’s to offset the grey skies coming our way this seasons, but in terms of colour trends, designers opted for vibrant shades in their fall/winter collections. The “It” piece that had fashion audiences reaching for their camera apps was Joseph Altuzarra’s bright pink and grey wrap coat. The hot pink provided a striking contrast to the otherwise muted robe coat. Dior also created a showstopper with their bright pink and green dress combination. Reviving the colour-blocking trend from previous seasons, Prabal Gurung used a more traditionally warm autumn colour palette such as auburn, orange and reds and paired them with greys and black. Bright psychedelic prints at Dries Van Noten. Eye-catching prints are also hot for fall. Marc by Marc Jacobs showed graphic prints and patterns fit for a tough biker chick. Kenzo embraced dark surrealism using embroidery and printed fabrics while Proenza Schouler created a cool effect with multi-layered prints and 3-D textures. Even Chanel incorporated funky geometric patterns onto their coats and dresses. 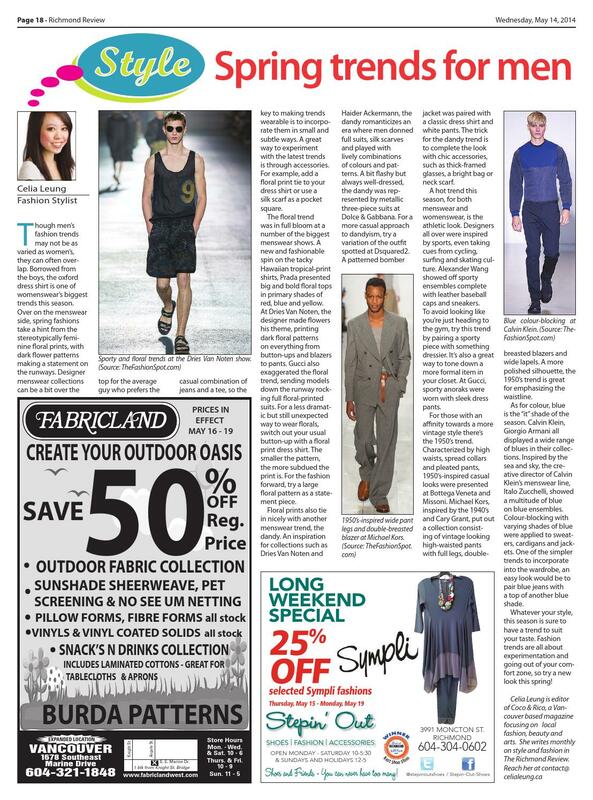 A mix of rave culture, optical illusion and art exhibit, the print trend this season is not for the fashion shy. Ease into the trend using graphic print accessories such as bags, shoes or caps and keep the rest of the ensemble relatively simple. Sometimes one statement piece is all you need to make your outfit stand out. Fall is always a great time to experiment with personal style since we can layer items we already love with new trendy pieces. So explore this season’s trends and have fun with fashion! Experiencing the thrill of the hunt combined with acquiring unique pieces, vintage shopping can be a fashion lover’s dream. It’s also an eco-friendly way to shop since merchandise is recycled from previous owners. And with the popularity of shows like Mad Men and Downton Abbey, vintage shopping and historic clothing have seen a renewed interest from trendy audiences and savvy shoppers. So if you’re tired of seeing someone else wearing the same outfit you bought at a chain store, give consignment, thrift or vintage stores a try. Since previous eras valued handmade details and durability, a truly vintage high-end piece will tend to have better quality than something more contemporary. 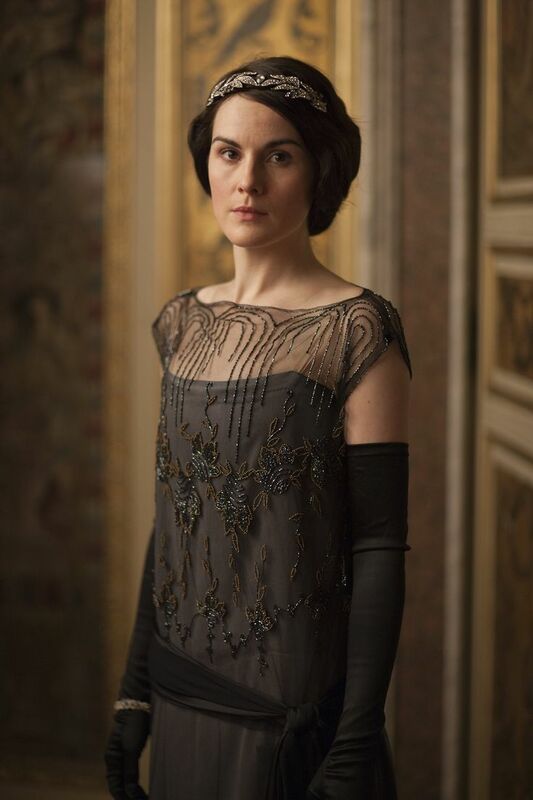 Early 1920s costumes on Downton Abbey. In terms of secondhand shops, consignment stores are where the profit is split between the shop and the person who brought in the clothes to be sold. This differs from thrift stores where merchandise is donated and the profits go back towards the store or a charity. Consignment shops are typically where one would find higher-end labels since they’re picky about what items will sell. Vintage stores, on the other hand, usually sell merchandise with a sense of history and cultural significance — the clothes are timeless and reflect a specific fashion era. When shopping at secondhand stores it’s important to keep in mind the condition of the item, quality of the piece and whether it can be worn as a classic staple or as a trend for the season. And when it comes to higher-end brands, verifying its authenticity is essential. It’s difficult to shop consignment or thrift with a specific item to look for, so always try to go in with an open mind. Channel Mad Men with vintage nipped waist dresses. Keep your eyes peeled for pieces that will fit well into your existing wardrobe and that can be easily tailored to fit. If an item doesn’t complement your personal style, it’ll run the risk of looking like a costume. A good way to start secondhand shopping would be to look for classic pieces with clean lines, quality materials and simple designs. Know what era works for you in terms of fit and style preference. Whether you’re more drawn towards the 1920s flapper period, 60s mod or 70s hippie look, you’ll get more mileage out of the purchase by ensuring the piece is wearable and fits in with your sense of style. Your sizing may vary when shopping at secondhand stores. Sizing measurements can change over time and between different brands. So if an item catches your eye, try it on regardless of the number on the label. 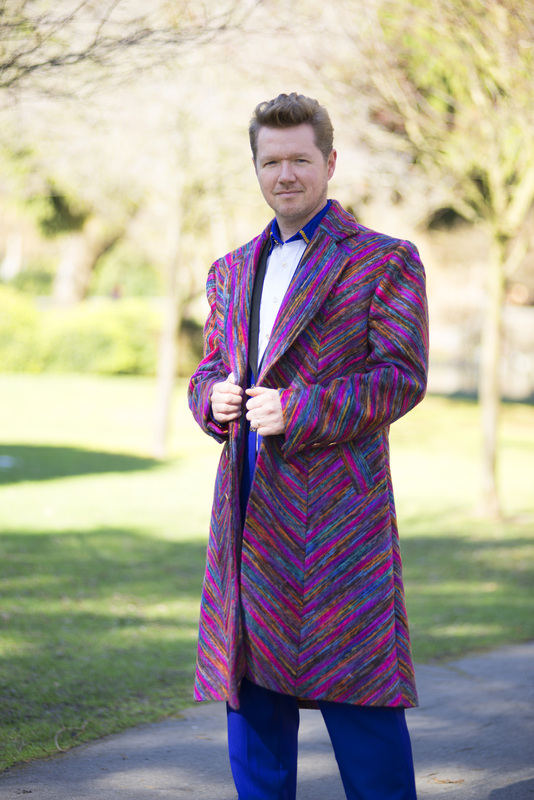 Tailoring can also be a very important part of the vintage shopping process. The right tailoring can turn a vintage frock from oversized and frumpy to looking like something high-end and custom made. However, not every piece can be altered, so take into consideration the fabric and structure of the garment. Cinching baggier tops or dresses with a belt can also do wonders to define the waist for a more flattering fit. 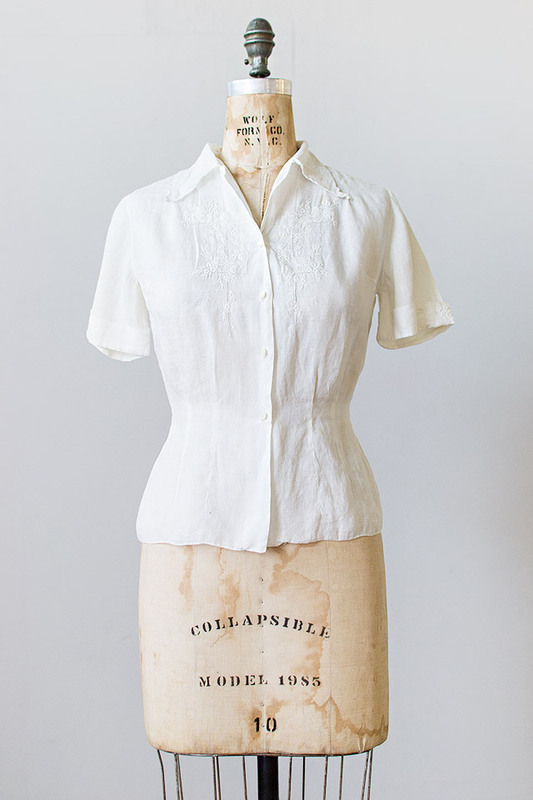 Mix a vintage blouse into your modern wardrobe. But before you head to the register, double check the item’s condition carefully. Look for any damage, stains, fading, missing details or loose embellishments. A quick way to check for areas of excessive wear is to hold the clothing up to the light. 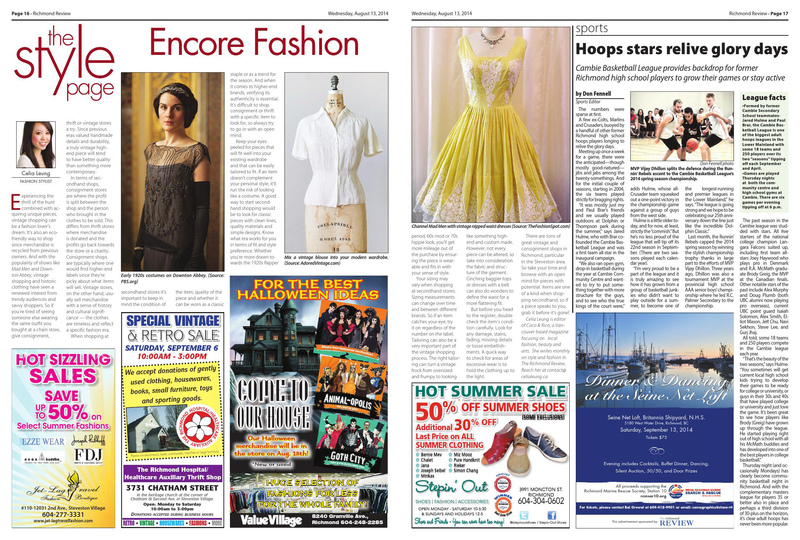 There are tons of great vintage and consignment shops in Richmond, particular in the Steveston area. So take your time and browse with an open mind for pieces with potential. Items are one of a kind when shopping secondhand, so if a piece speaks to you, grab it before it’s gone! On humid summer days, even dressing up for an event can feel like a chore. But with some simple yet stylish party look ideas, getting ready will be easy breezy. Whether attending a garden party, barbecue or outdoor wedding, have a few outfit, hair and makeup looks in mind for quick, fuss-free ensembles. A chic alternative to dresses this season are jumpsuits and rompers. One of this season’s hottest trends, the one-piece is a fun go-to party look. Characterized by a top attached to either pants or shorts, jumpsuits and rompers allow a streamlined, unbroken silhouette. It’ll also save you the hassle of determining which top goes with which bottoms. Slip on a romper for an quick summer party look. For a more understated look, go for jumpsuits and rompers in solid colours. Solid colours will also make it easier to pair the garment with shoes, bags and jewelry. Belts are an especially good way to break up solid jumpsuits and define the waist. For a more dramatic look, patterned jumpsuits will ensure you stand out from the crowd. Jersey and linen fabrics also offer a casual vibe while silk and satins are better for nighttime or more formal events. If you prefer shorts to beat the heat, try changing it up with patterned versions. They can easily pair with a solid blouse or tank in a complementary shade. Subtle patterns such as stripes and polka dots are a great way to venture into the trend while the fashion bold can rock colourful prints such as batik, animal or giant florals. The key to finding flattering patterned shorts is fit. Baggy patterned ones tend to enlarge your hips and make it appear like you’re wearing a short skirt rather than a pair of shorts with defined lines. Whatever the length of your shorts, go for a patterned pair that is fitted without adding bulk to your lower half. Add some colour with patterned shorts. Summer party outfits aren’t complete without fun accessories, makeup and hair. Since hot days call for easy to maintain hairstyles, waves are an excellent, romantic option. This season calls for carefree loose waves that don’t need to be overstyled. 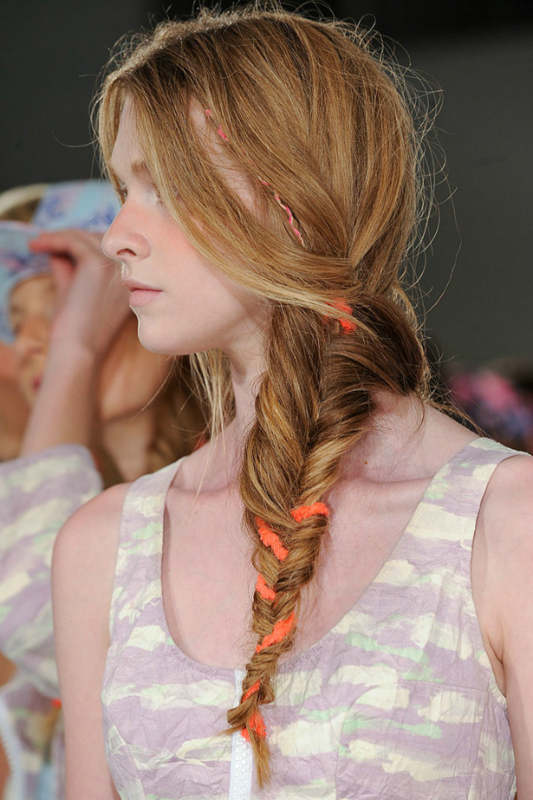 One of the simplest ways to get the look is through braiding damp hair. Once dried, tousle the hair a bit with your fingers. And since messy side braids are also popular this summer due to the athletic fashion trend, you can work a braid for the daytime and untie the plait for the evening, creating beachy waves. Braids were the highlight of the Calla show. As for party makeup, piling on heavy foundation is the last thing we want to do in warmer weather, so it’s no wonder that a sheer, natural face is in this season for a base. Makeup artists backstage at the fashion shows relied on dewy moisturizers and light coverage this season, letting bold colours on either the eyes or lips do the talking. For a bright pop of colour on the lids, aqua colours such as shades of blue and green were popular on the runway. Marc Jacobs and Miu Miu, for example, incorporated turquoise shadows and cobalt blue liner to eyes of their models. Prefer a less dramatic alternative to try the trend? Switch out your black or brown eyeliner with navy. If you want to play up your lips, the hottest hue this season veers toward orange lipsticks. Spotted at the Rag & Bone and Prabal Gurung shows, try an orange-red for a more natural shade. Matte fuchsia is also a big trend for those who stick to pink lip colours. Whether you’re making a statement on your eyes or on your lips, finish off with some mascara and a touch of bronzer or blush for a healthy glow. Summer’s the season to incorporate wild colours and patterns into your outfits, so have fun with your party looks! With summer arriving it’s easier to let your personal style shine through accessories rather than layers of clothes. So take some fashion cues from this season’s biggest trends and update your warm weather outfits with chic extras. The art trend is huge for spring and summer, translating to paint-splattered accessories, sculpted heels, hand-painted bags and jewelry. Saint Laurent showcased patchworked shoes while elaborated painted boots were a showstopper at Miu Miu. 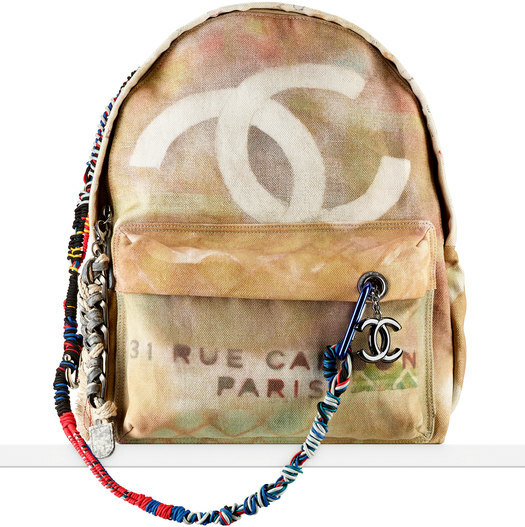 Another example of the art trend is also one of the most dividing accessories of the spring 2014 season the graffiti printed canvas backpack at Chanel. If you like the look, avoid the hefty price tag and create a version of your own for your next DIY project. All you’ll need is a plain canvas bag, fabric spray paint, and some design ideas. Globally inspired details are also on trend this season. Look for accessories with traditional embroidery, tribal beadwork and fringed tassels in vivid patterns and colours. The idea for this trend is to accessorize with items that look like souvenirs from an exotic trip. Even better if it’s authentic! Try adding a woven clutch in a bright hue to a neutral ensemble for a pop of colour. Florals, of course, is always popular for the warmer months. Shoes adorned with flowers paraded down the runways at Christian Dior and Dolce & Gabbana, while floral prints made their mark on handbags at Nina Ricci and Christian Louboutin. There are a multitude of ways to incorporate floral accessories to your wardrobe, but for a festive touch try adding a floral pin or headband to your updo at the next party. Gladiators are slowly becoming a classic style for summer sandals. So it’s no wonder another trend for this season is the warrior look. Bold metal cuffs, chunky buckled sandals and multi-finger rings made an impact at the shows. The key is oversized metals such as giant gilded belt buckles, statement necklaces with metal plating, and chokers — thick necklaces worn close to the collar bone. 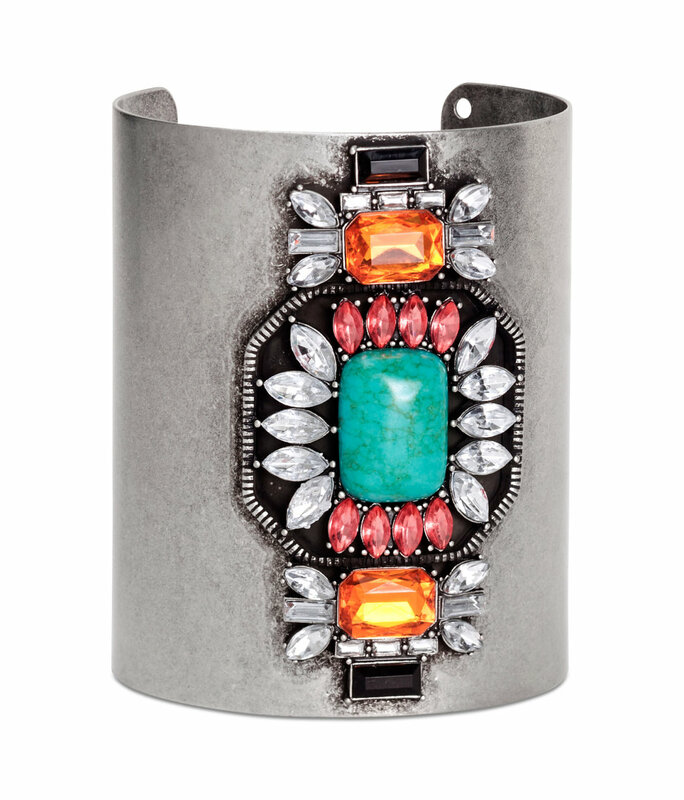 Two trends in one, accessorize with a cuff like a global warrior. In terms of shoes, mules and slings are making a big comeback, as seen at Fendi and Celine. 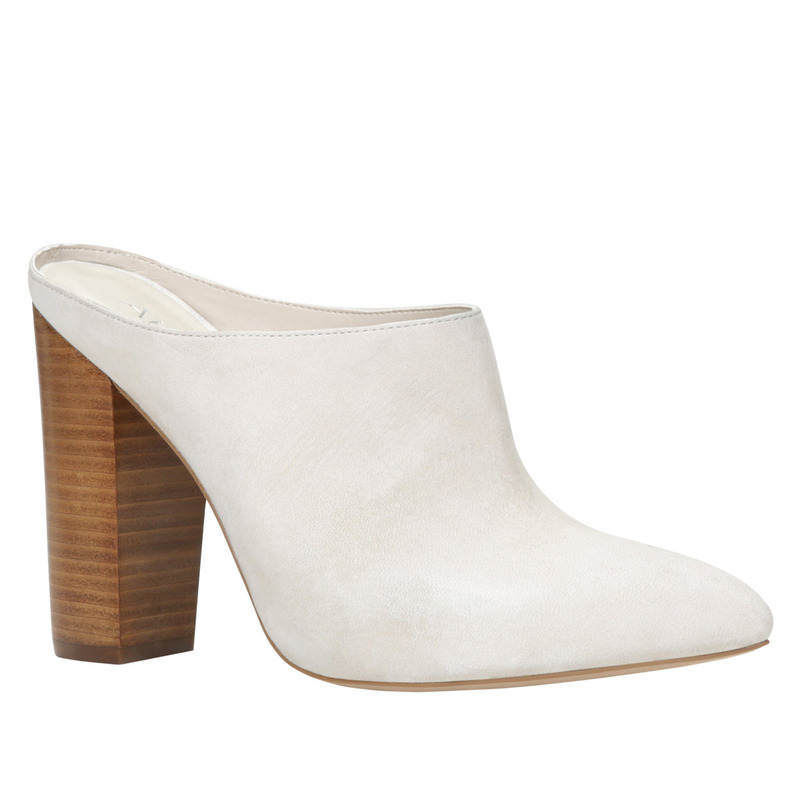 Whether low or high heeled, pointy or round, closed or peep toed, designers gave their modern take on the mule. Rochas sported a feathered number, while beach-ready mules made of cork and fringed canvas were spotted at Chloe. As long as the shoes are backless, they’ll be on trend this season. This season’s hottest shoe style, the mule. If heels aren’t your thing, then the sporty footwear trend may be more up your alley. Complete your outfits with athletic accessories such as sneakers and chic duffel bags. From Prada’s sport sandals to visors at Marni and DKNY, don’t be afraid to pair sporty extras with dresses and skirts. Slides and backpacks are also popular accessories stemming from the sport trend. A more polished alternative to flip-flops, slides can also be dressed with down boyfit jeans or dressed up with maxi skirts. As for purses, bucket bags are the “it” accessory this summer. Roomier than most clutches and the ever so popular crossbody bags, bucket bags were found on the runways at Louis Vuitton and Chloe. Characterized by a structured sack silhouette that clinches at the top like a drawstring, there’s a bucket bag for every style. Look for a studded version if you’re more punk rock, for example. Or if you prefer a more glamorous style, go for a metallic leather bucket bag. 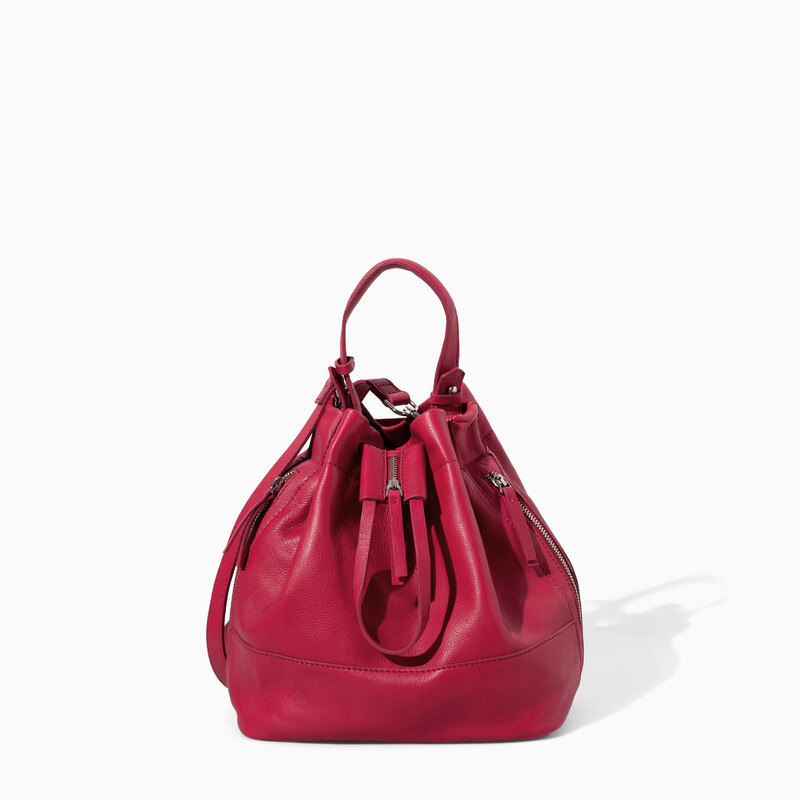 Stash all your summer essentials into a bucket bag like this one from Zara. Accessories are the perfect starting point to explore outside your personal style. 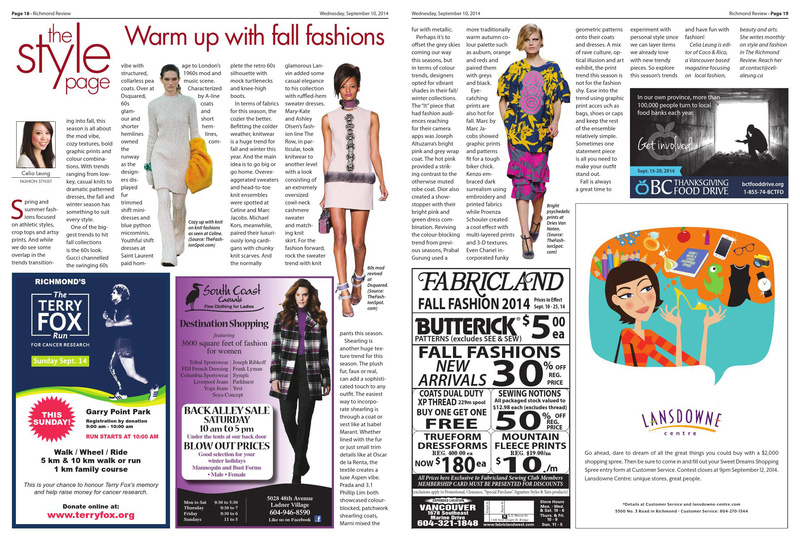 And with all the different fashion trends for the season, there’s definitely something for everyone. Though men’s fashion trends may not be as varied as women’s, they can often overlap. Borrowed from the boys, the oxford dress shirt is one of womenswear’s biggest trends this season. Over on the menswear side, spring fashions take a hint from the stereotypically feminine floral prints, with dark flower patterns making a statement on the runways. Designer menswear collections can be a bit over the top for the average guy who prefers the casual combination of jeans and a tee, so the key to making trends wearable is to incorporate them in small and subtle ways. A great way to experiment with the latest trends is through accessories. For example, add a floral print tie to your dress shirt or use a silk scarf as a pocket square. 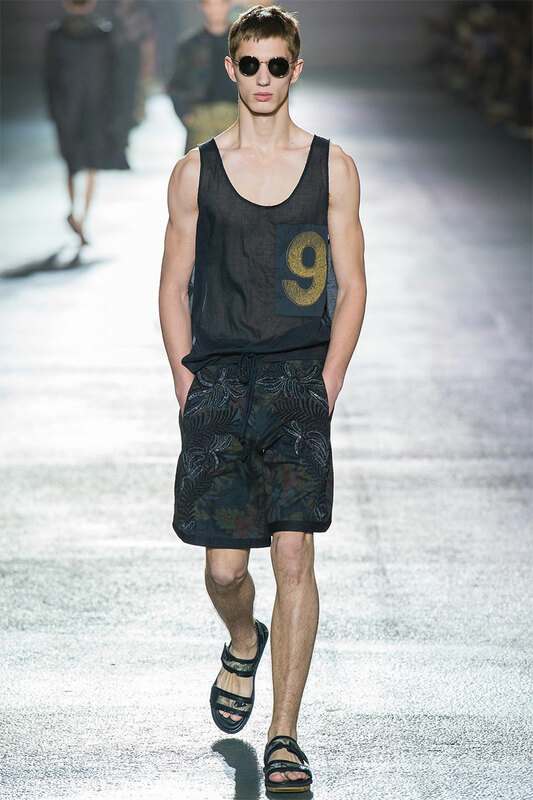 Sporty and floral trends at the Dries Van Noten show. The floral trend was in full bloom at a number of the biggest menswear shows. A new and fashionable spin on the tacky Hawaiian tropical-print shirts, Prada presented big and bold floral tops in primary shades of red, blue and yellow. At Dries Van Noten, the designer made flowers his theme, printing dark floral patterns on everything from button-ups and blazers to pants. Gucci also exaggerated the floral trend, sending models down the runway rocking full floral-printed suits. For a less dramatic but still unexpected way to wear florals, switch out your usual button-up with a floral print dress shirt. The smaller the pattern, the more subdued the print is. For the fashion forward, try a large floral pattern as a statement piece. Floral prints also tie in nicely with another menswear trend, the dandy. An inspiration for collections such as Dries Van Noten and Haider Ackermann, the dandy romanticizes an era where men donned full suits, silk scarves and played with lively combinations of colours and patterns. A bit flashy but always well-dressed, the dandy was represented by metallic three-piece suits at Dolce & Gabbana. For a more casual approach to dandyism, try a variation of the outfit spotted at Dsquared2. A patterned bomber jacket was paired with a classic dress shirt and white pants. The trick for the dandy trend is to complete the look with chic accessories, such as thick-framed glasses, a bright bag or neck scarf. A hot trend this season, for both menswear and womenswear, is the athletic look. Designers all over were inspired by sports, even taking cues from cycling, surfing and skating culture. Alexander Wang showed off sporty ensembles complete with leather baseball caps and sneakers. To avoid looking like you’re just heading to the gym, try this trend by pairing a sporty piece with something dressier. It’s also a great way to tone down a more formal item in your closet. At Gucci, sporty anoraks were worn with sleek dress pants. 1950’s-inspired wide pant legs and double-breasted blazer at Michael Kors. For those with an affinity towards a more vintage style there’s the 1950’s trend. Characterized by high waists, spread collars and pleated pants, 1950’s-inspired casual looks were presented at Bottega Veneta and Missoni. 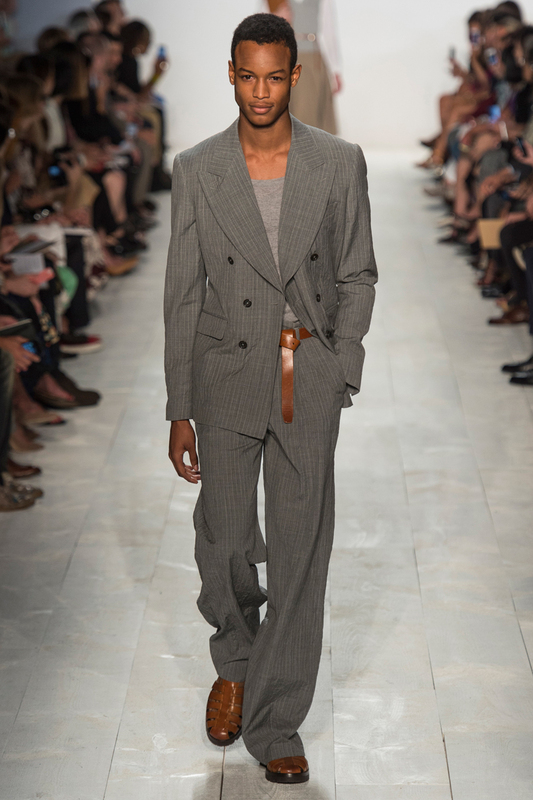 Michael Kors, inspired by the 1940’s and Cary Grant, put out a collection consisting of vintage looking high-waisted pants with full legs, double-breasted blazers and wide lapels. 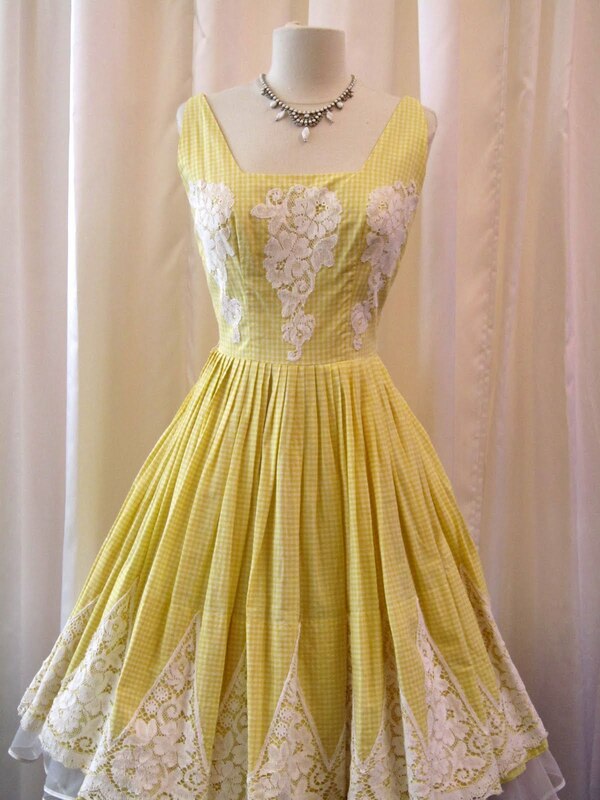 A more polished silhouette, the 1950’s trend is great for emphasizing the waistline. 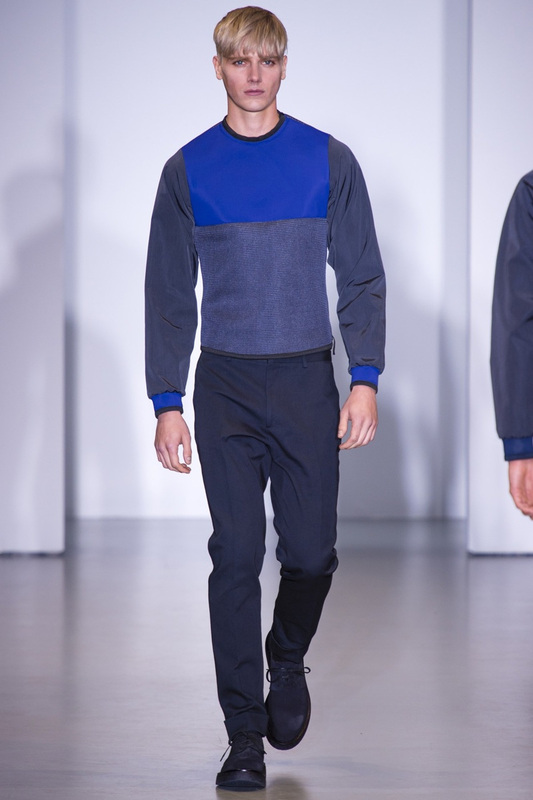 Blue colour-blocking at Calvin Klein. As for colour, blue is the “it” shade of the season. Calvin Klein, Giorgio Armani all displayed a wide range of blues in their collections. Inspired by the sea and sky, the creative director of Calvin Klein’s menswear line, Italo Zucchelli, showed a multitude of blue on blue ensembles. Colour-blocking with varying shades of blue were applied to sweaters, cardigans and jackets. One of the simpler trends to incorporate into the wardrobe, an easy look would be to pair blue jeans with a top of another blue shade. Whatever your style, this season is sure to have a trend to suit your taste. Fashion trends are all about experimentation and going out of your comfort zone, so try a new look this spring! There are a multitude of reasons to support local designers — whether it’s to build stronger communities, reduce environmental impact or just to avoid wearing the same mass-marketed outfit as someone else. But the most important reason to shop locally should be to bolster the creativity of talented artists. 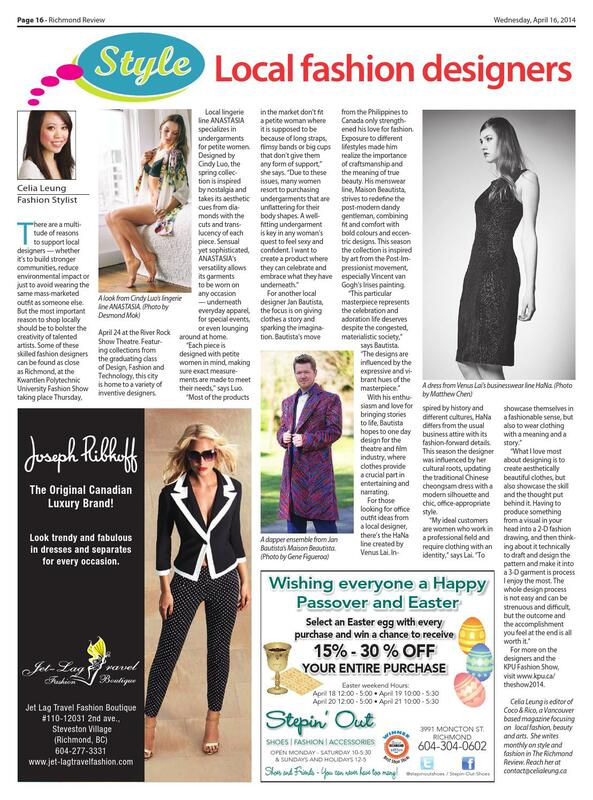 Some of these skilled fashion designers can be found as close as Richmond, at the Kwantlen Polytechnic University Fashion Show taking place Thursday, April 24 at the River Rock Show Theatre. Featuring collections from the graduating class of Design, Fashion and Technology, this city is home to a variety of inventive designers. Local lingerie line ANASTASIA specializes in undergarments for petite women. Designed by Cindy Luo, the spring collection is inspired by nostalgia and takes its aesthetic cues from diamonds with the cuts and translucency of each piece. Sensual yet sophisticated, ANASTASIA’s versatility allows its garments to be worn on any occasion — underneath everyday apparel, for special events, or even lounging around at home. “Each piece is designed with petite women in mind, making sure exact measurements are made to meet their needs,” says Luo. For another local designer Jan Bautista, the focus is on giving clothes a story and sparking the imagination. Bautista’s move from the Philippines to Canada only strengthened his love for fashion. Exposure to different lifestyles made him realize the importance of craftsmanship and the meaning of true beauty. His menswear line, Maison Beautista, strives to redefine the post-modern dandy gentleman, combining fit and comfort with bold colours and eccentric designs. This season the collection is inspired by art from the Post-Impressionist movement, especially Vincent van Gogh’s Irises painting. With his enthusiasm and love for bringing stories to life, Bautista hopes to one day design for the theatre and film industry, where clothes provide a crucial part in entertaining and narrating. 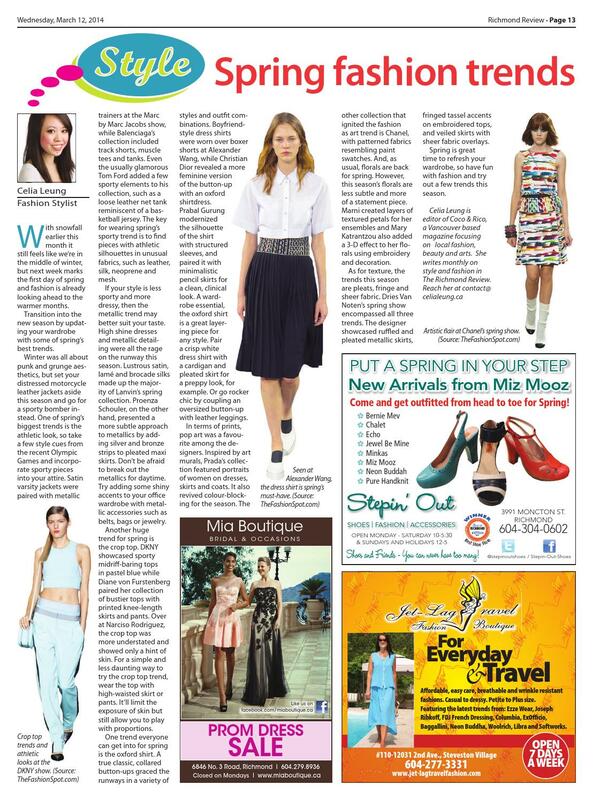 For those looking for office outfit ideas from a local designer, there’s the HaNa line created by Venus Lai. Inspired by history and different cultures, HaNa differs from the usual business attire with its fashion-forward details. This season the designer was influenced by her cultural roots, updating the traditional Chinese cheongsam dress with a modern silhouette and chic, office-appropriate style. For more on the designers and the KPU Fashion Show, visit www.kpu.ca/theshow2014. With snowfall earlier this month it still feels like we’re in the middle of winter, but this Thursday marks the first day of spring and fashion is already looking ahead to the warmer months. Transition into the new season by updating your wardrobe with some of spring’s best trends. Winter was all about punk and grunge aesthetics, but set your distressed motorcycle leather jackets aside this season and go for a sporty bomber instead. One of spring’s biggest trends is the athletic look, so take a few style cues from the recent Olympic Games and incorporate sporty pieces into your attire. Satin varsity jackets were paired with metallic trainers at the Marc by Marc Jacobs show, while Balenciaga’s collection included track shorts, muscle tees and tanks. Even the usually glamorous Tom Ford added a few sporty elements to his collection, such as a loose leather net tank reminiscent of a basketball jersey. The key for wearing spring’s sporty trend is to find pieces with athletic silhouettes in unusual fabrics, such as leather, silk, neoprene and mesh. Crop top trends and athletic looks at the DKNY show. If your style is less sporty and more dressy, then the metallic trend may better suit your taste. High shine dresses and metallic detailing were all the rage on the runway this season. Lustrous satin, lamé and brocade silks made up the majority of Lanvin’s spring collection. Proenza Schouler, on the other hand, presented a more subtle approach to metallics by adding silver and bronze strips to pleated maxi skirts. Don’t be afraid to break out the metallics for daytime. Try adding some shiny accents to your office wardrobe with metallic accessories such as belts, bags or jewelry. Metallic detailing at Proenza Schouler. Another huge trend for spring is the crop top. DKNY showcased sporty midriff-baring tops in pastel blue while Diane von Furstenberg paired her collection of bustier tops with printed knee-length skirts and pants. Over at Narciso Rodriguez, the crop top was more understated and showed only a hint of skin. For a simple and less daunting way to try the crop top trend, wear the top with high-waisted skirt or pants. It’ll limit the exposure of skin but still allow you to play with proportions. One trend everyone can get into for spring is the oxford shirt. A true classic, collared button-ups graced the runways in a variety of styles and outfit combinations. Boyfriend-style dress shirts were worn over boxer shorts at Alexander Wang, while Christian Dior revealed a more feminine version of the button-up with an oxford shirtdress. Prabal Gurung modernized the silhouette of the shirt with structured sleeves, and paired it with minimalistic pencil skirts for a clean, clinical look. A wardrobe essential, the oxford shirt is a great layering piece for any style. Pair a crisp white dress shirt with a cardigan and pleated skirt for a preppy look, for example. Or go rocker chic by coupling an oversized button-up with leather leggings. Seen at Alexander Wang, the dress shirt is spring’s must-have. In terms of prints, pop art was a favourite among the designers. Inspired by art murals, Prada’s collection featured portraits of women on dresses, skirts and coats. It also revived colour-blocking for the season. The other collection that ignited the fashion as art trend is Chanel, with patterned fabrics resembling paint swatches. And, as usual, florals are back for spring. However, this season’s florals are less subtle and more of a statement piece. Marni created layers of textured petals for her ensembles and Mary Katrantzou also added a 3-D effect to her florals using embroidery and decoration. Artistic flair at Chanel’s spring show. As for texture, the trends this season are pleats, fringe and sheer fabric. Dries Van Noten’s spring show encompassed all three trends. The designer showcased ruffled and pleated metallic skirts, fringed tassel accents on embroidered tops, and veiled skirts with sheer fabric overlays. Spring is great time to refresh your wardrobe, so have fun with fashion and try out a few trends this season.